Researchers can identify patients with Barrett’s esophagus (BE) based on profiles of exhaled volatile organic compounds measured with an electronic nose device. This tool, described in the January issue of Gastroenterology, provides a portable, accessible, and widely acceptable tool for screening and surveillance for BE in patients with gastroesophageal reflux disease (GERD). Electronic nose (e-nose) devices use chemical to electrical interfaces to measure the subtle volatile organic compounds exhaled by patients. When data are analyzed by a machine learning platform, researchers can identify patients with certain diseases. BE, a precursor to esophageal adenocarcinoma (EAC), could be a prototype disease for e-nose application. Early detection and treatment of BE is important to reduce the risk of progression to EAC, but screening the general population by endoscopy is not cost effective. 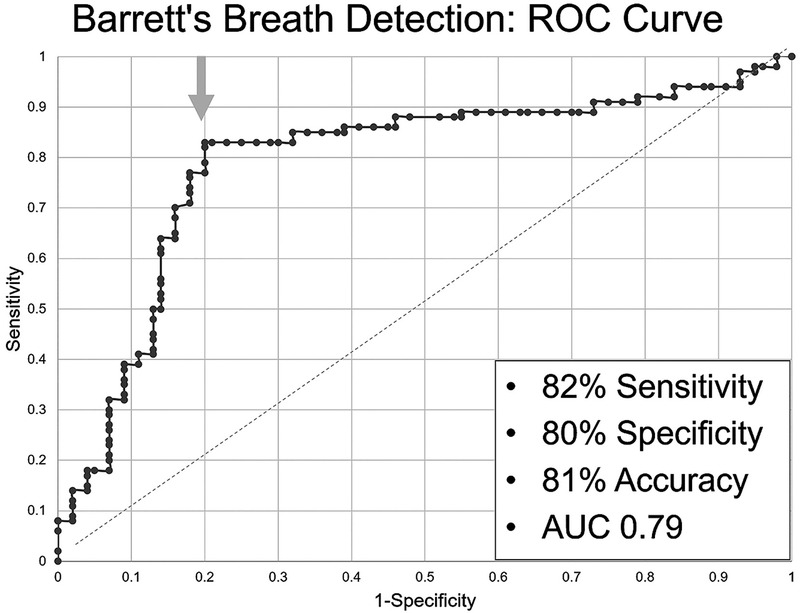 Daniel K. Chan et al investigated whether the e-nose breath test provided an accurate, affordable, and acceptable technique for detection of BE. Chan et al performed a cross-sectional study to analyze breath volatile organic compounds exhaled by 122 patients undergoing treatment or surveillance for the presence or absence of BE. Each subject was recruited for breath testing immediately before a routinely scheduled esophagogastroduodenoscopy and provided a 5-minute continuous breath sample. Biopsies were collected from each subject during esophagogastroduodenoscopy and analyzed for histopathologic evidence of BE and used as the reference standard. Each patient’s breath was analyzed in real time using the e-nose device, which measured conductance changes at the sensor level of aggregate exhaled volatile organic compounds. The compound profiles were introduced into an artificial neural network, in a supervised fashion, to identify data classifiers that could discriminate between subjects with or without BE. Optimal models were cross-validated using a leave-some-out approach. Chan et al found the technique to identify patients with BE with 82% sensitivity, 80% specificity, 81% accuracy, and an area under curve value of 0.79. More than 95% of the subjects invited to participate in the study enrolled, so breath testing appears to be widely acceptable. The authors explain that unlike a mass spectrometer, which identifies individual gasses based on mass-to-charge ratio, the e-nose device interacts with exhaled volatile organic compounds in aggregate and measures an electronic conductivity profile specific to the compounds. This aggregate profile, called breath print, can characterize the composition of the compounds in an individual’s breath. By analyzing a group of breath prints from patients with the same disease, such as BE, individual differences of diet, medications, comorbidities, and other factors can be filtered out to identify features that distinguish the compounds of patients with that disease. Chan et al propose that this tool be used in noninvasive screening of patients for BE, who are at risk for EAC. Can Histologic Features Identify Patients with GERD?